Now that we are past the foolishness of April 1 it's time to get back to having fun here at The Shave Nook. This is the second of several PIF's. Post your interest here and I will have a randomizer select the winner on Friday the 5th. Don't count me in, but wonderful PIF. Nice razor, nice PIF! Both one of the best looking razors ever made IMO, and the closed comb Damaskeene is a really good introduction to SE razors for some lucky person. That will not be me however. It's a very nice razor. I just shaved with one for the first time the last couple days, and it's really smooth. Someone is going to be quite lucky to win this. Great looking Gem, please count me in. The Damaskeene (both closed & open comb) is about the only 1912 I haven't tried yet. I'd love a chance at this beauty! Thanks! I have a 1912 with a different handle and a Junior. What makes it Damaskeene? I love mine, so pass it on. (04-01-2012, 05:44 PM)lindyhop66 Wrote: I have a 1912 with a different handle and a Junior. What makes it Damaskeene? I love mine, so pass it on. The Damaskeene is identified by "Damaskeene" looking at you from the inside when it's open. I can't speak for the open comb version, never having used one. But the order of progressive aggresiveness in the series is Damaskeene as the mildest, then Jr, then 1912. Check out the blade exposure pics to see the difference. After reading more about the curved Damaskeene head and mild but close shave, please do count me in for this PIF. I would like to try this one. "So pass it on"? I think that means you are not putting your name in for the PIF, or, am I wrong? I changed my mind and wrote the second message saying count me in. I don't have the Damaskeene and would love to have it. I have the regular 1912 and Junior, not the Damaskeene. I read the thread link ShadowsDad messaged me and decided I wanted to try the Damaskeene. Don't count me in since I won the last PIF you did, but beautiful razor and awesome giveaway! Count me in! I would love to start se shaving. Please do count me in. I just tried an SE for the first time yesterday, and after 2 shaves with it I am definitly on the lookout for one! 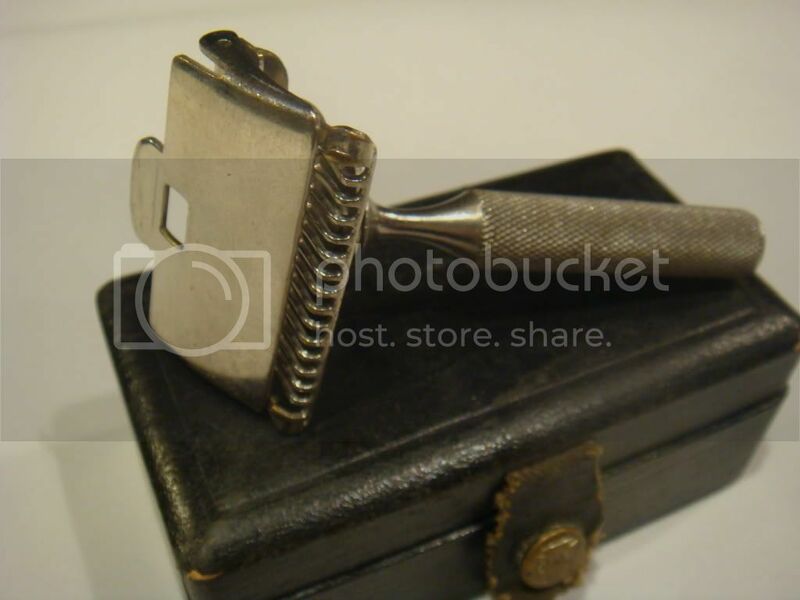 Great looking razor and PIF, sir. Do NOT count me in even though i should try one someday. Good luck. The winner of this PIF, as chosen by randomizer, is lindyhop66. Congrats on the Damaskeene. I just got one on Ebay in much shabbier condition. What is that knurled handle made of? Mine seems to be either rusty or very heavily tarnished.